Not counted towards your tag license limit. The SMS Appliance tag works in conjunction with the Alarm Notification System option to allow alarm notifications to be sent as text messages to a mobile cellular device, and to allow alarm acknowledgment via SMS. SMS messages are sent and received using an "SMS appliance," which is a cell phone (or "cell modem") tethered to a VTScada workstation via RS-232, Bluetooth, or USB. Any such "cell modem" should conform to ETSI TS 100 585, which is a part of the GSM standard applying to the AT command set for sending and receiving text messages. Devices that use the CDMA standard are not supported. The SMS Appliance tag handles communications through the SMS appliance. The tag registers with the SMS Manager service as an SMS agent. 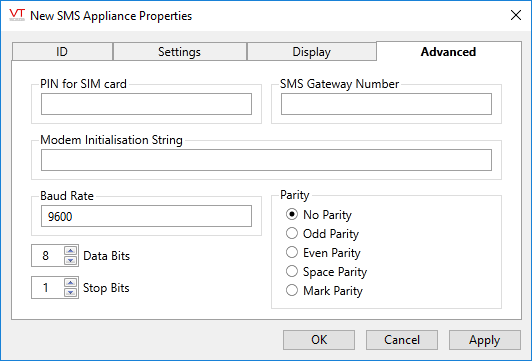 Since SMS appliances are usually installed as "modems" under MS Windows™, the configuration of the SMS Appliance tag enables the specification of this modem and the workstation to which the modem is attached. You may also set a security privilege, and if necessary, can mark the modem as disabled. If running multiple applications (for example, hosted systems) modems, SMS devices, and Twilio accounts cannot be shared between applications. You must have independent modems or Twilio accounts for each application. The SMS Manager takes care of forwarding message requests to any registered SMS agents in a round-robin sequence. It also provides a publisher for received SMS text messages. Code that subscribes to received messages will get notification of all received text messages. Subscribers are responsible for any filtering of received text messages. The SMS Appliance tag will re-initialize the appliance once per minute to verify that it is still attached and functioning. Any error will result in a complete reset, which is repeated at a regular interval until the tag is disabled or a functioning device is available. The SMS Appliance tag will queue messages to send, so long as it is operating normally. Received messages are published immediately. If these should be queued, it is the responsibility of the subscriber to do so. The ID tab of every tag includes the same four elements. Name, Area, Description and Help ID. Uniquely identifies each tag in the application. If the tag is a child of another, the parent names will be displayed in a separate area before the name field. You may right-click on the tag's name to add or remove a conditional start expression. Limit the number of tags loaded upon startup. Filter the alarm display to show only certain areas. When working with Parent-Child tag structures, the area property of all child tags will automatically match the configured area of a parent. Naturally, you can change any tag's area as required. In the case of a child tag, the field background will turn orange to indicate that you have applied an override. To use the area field effectively, you might consider setting the same Area for each I/O driver and its related I/O tags in order to group all the tags representing the equipment processes installed at each I/O device. You might also consider naming the Area property for the physical location of the tag (i.e. a station or name of a landmark near the location of the I/O device). For serial port or Roster tags, you might configure the Area property according to the purpose of each tag, such as System or Communications. You may define as many areas as you wish and you may leave the area blank for some tags (note that for Modem tags that are to be used with the Alarm Notification System, it is actually required that the area field be left blank). To define a new area, type the name in the field. It will immediately be added. To use an existing area, use the drop-down list feature. Re-typing an existing area name is not recommended since a typo or misspelling will result in a second area being created. There is no tool to remove an area name from VTScada since such a tool is unnecessary. An area definition will exist as long as any tag uses it and will stop existing when no tag uses it (following the next re-start). Tag names tend to be brief. The description field provides a way to give each tag a human-friendly note describing its purpose. While not mandatory, the description is highly recommended. Tag descriptions are displayed in the tag browser, in the list of tags to be selected for a report and also on-screen when the operator holds the pointer over the tag’s widget. For installations that use the Alarm Notification System, the description will be spoken when identifying the tag that caused the alarm. The description field will store up to 65,500 characters, but this will exceed the practical limits of what can be displayed on-screen. The Settings tab is used to identify the SMS appliance (SMS "modem") that will be used to send and receive messages. The name of the computer, running the VTScada application, to which the SMS appliance is attached. The named workstation will be checked for devices. If more than one is found, you may select between them using this drop-down list. Select an application security privilege from this drop down if you wish to limit the operation of this control to only those operators who have been granted the matching security privilege. In this case, "operation" refers to the ability to disable or enable the tag via the context menu. It does not affect whether or not SMS messages are sent while a user without the privilege is logged on. Application privileges are added using the Administrative Settings security dialog. 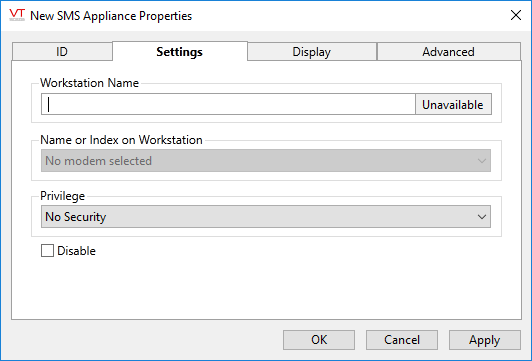 Information on creating application privileges can be found in "Add Application Privileges Using the Administrative Settings Dialog". Check this box to disable the device without removing it or deleting its configuration. The fields in the Advanced tab are optional. These need not be set for most configurations and should only be configured by developers who are familiar with the configuration of SMS devices. In rare instances, a device might not use a standard configuration of 9600 baud, etc. Serial port configuration fields are provided for use when working with such a device. If required, this will value will be assigned to you by your cellular provider. The password is pre-configured in most SIM cards. If required, this number will be provided by your cellular provider. This number is pre-configured in most SIM cards. You may provide an initialization string, as specified in the user manual for your cell modem. This will be sent to the cell modem at the beginning of each initialization cycle. In most cases, you do not need to provide this string to the tag. Change this field only if your device does not autobaud to 9600. If your device does not autobaud to 9600, you might also need to configure these other serial communication parameters. When this tag is represented on screen by widgets that are able to use a Style Settings tag, you can save development time by choosing the Style Settings tag that holds the correct display configuration for this tag instance. The default configuration will search for the first parent tag of the Style Settings type. If there is none, (message reads, "--Missing--") it will use System Style, the default style tag that is automatically part of every new VTScada application.